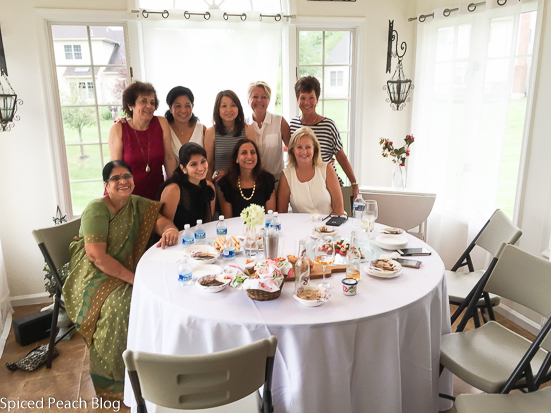 It’s International Ladies Group annual Barbecue time, and over the past twenty-two-twenty- three years what makes it special from our other events over the course of a year, is being one of the few functions where the husbands are invited. This year I hosted. 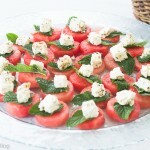 One of our pass around hors’ d oeuvres was this delicious and cheery colored Watermelon, Mint, Marinated Feta. Thanks to my youngest, Alex the Athlete for the beautiful prep work and plate styling. So easy to put together, while the getting is still good nearing the end of the season, you could easily include these refreshing finger treats at your Labor Day barbecue, coming up in just a week. What? Yes. Really. Where do the seasons go? I don’t know about you but sometimes it seems no matter how much I take advantage of the season, still, there always seems more yet left to do in taking full advantage of the moment. Summer Barbecue with International Ladies Group is actually our trickiest gathering endeavor between vacations and travel, along with many of the girls making trips to visit relatives back in native homelands, so coordinating or changing out dates is like a major feat of the United Nations. This year, and a few short of the group, our end of summer party still commenced, along with a couple of extra special attendees, Jyothi’s Mom, visiting from India, whom we call ‘Auntie’ who is in the green sari, along with Jyothi’s niece, Radhika, readying to attend the Master’s Program at Syracuse University. Also then joining us, my next door neighbor and dear friend, Karen, and her husband, Dave, just back from the shore, she’s in the navy and white stripe shirt. 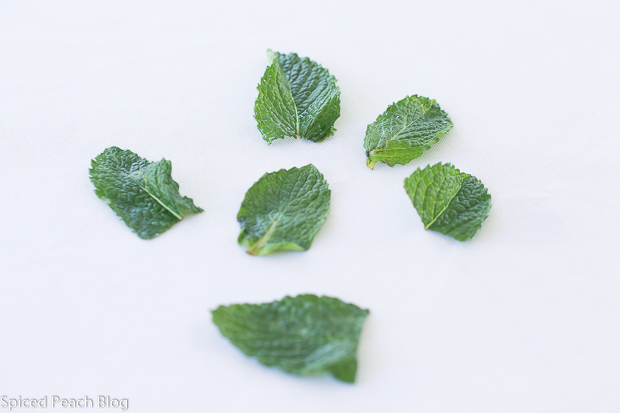 Lovely scented green mint from the garden provides such a fresh flavor combined with the watermelon confirming to me why this combination has become all the recent rage. I did switch things out a bit marinating the feta cheese which I thought Marcelle from Lebanon would enjoy better, she did. Traditional tiny cups in tow, with Grace from Malaysia providing the cooking vessel, following dinner, Marcelle then prepared her famous Lebanese coffee always presented on a long serving tray, our longtime group beverage concluding the meal with dessert which in the process caused Marcelle and I to determine that we indeed do need a Lebanese Coffee post on Spiced Peach Blog. This all occurred before Beatrice, also from Malaysia, began dabbing the tears from her eyes thanking me for such a lovely event and sharing tender appreciation for how much work I always put into hosting the group. This was a rather unlikely scene for Beatrice and I couldn’t figure out if getting older just makes one more emotional, but nevertheless, it was a perfect moment for a big embrace, along with, of course, an invitation for her to always come back given such a compliment. That got a little chuckle from Karen Gallagher, who brought me into the group these many years ago when she was then married to the late Voltaire from Chile. One time Karen mysteriously just dropped by my house a few years back at the very moment I was short a couple of hands when hosting Alex’s American University Field Hockey Team for dinner one fall season. I still consider that circumstance like some sort of divine intervention. Cutting out the juicy, bright colored watermelon, piece by piece, treasuring the moment, the food, the shared table of friendship, all together what a lovely platter. Appetizer amounts may be prepared according to desired number of rounds using all or just half of the watermelon. 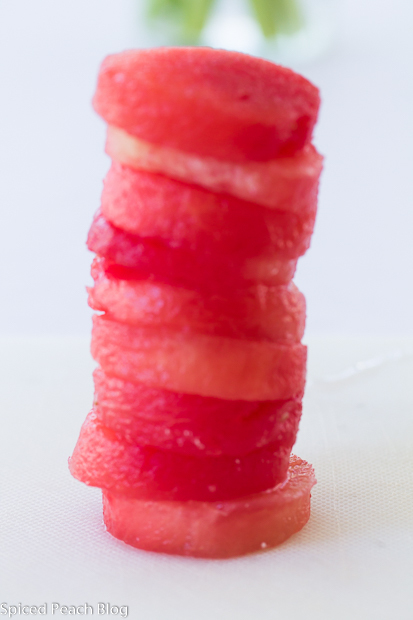 Number of rounds yielded per slice depends on the size of the watermelon. 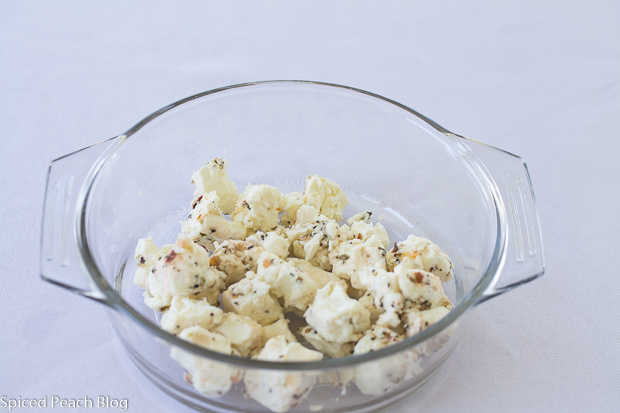 Prepare marinated feta cheese and let set to marinate for at least one hour. 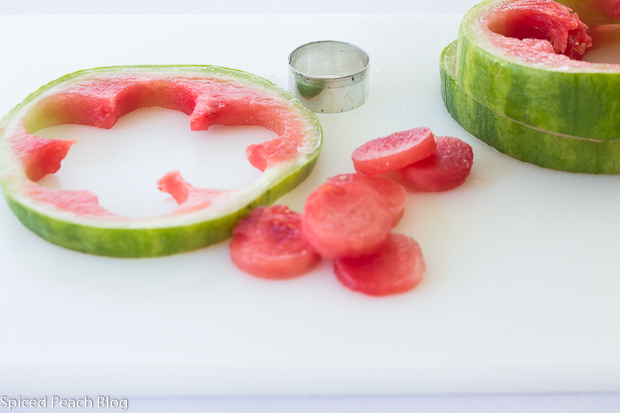 Make watermelon rounds using the round cookie cutter, setting onto a serving tray. 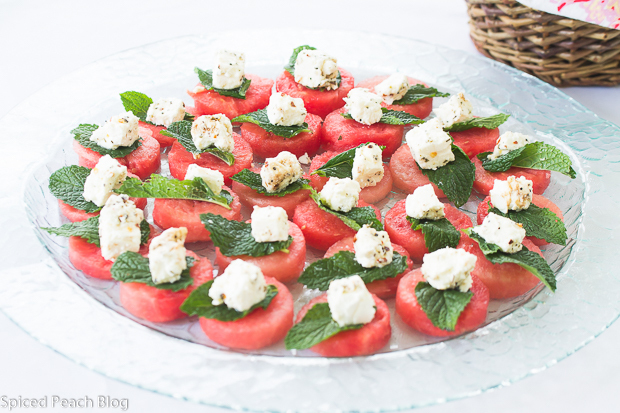 Add a mint leaf to each watermelon piece topping with a cube of marinated feta cheese. This entry was posted in Appetizers, Fruit and tagged Watermelon Mint Marinated Feta, Watermelon Mint Marinated Feta Appetizer. Bookmark the permalink. Post a comment or leave a trackback: Trackback URL. Peg, these look sensational and easy enough for me to make. I like the circle sizes too, perfect amount for an appetizer. Thank You Meredith! These are so simple to prepare and they look so pretty on a table too. Thanks for all your support, I appreciate it! Delicious looking Peg. I’m back home now just in case you throw any more bbqs where I can munch on a couple of these yummy treats, lol. See you soon. Thanks Joanne. Welcome Home! Looking forward to seeing you and catching up. Loved these. Thanks for the delicious dishes. What a wonderful dish to share at your gathering. It’s so true that no matter how much you use summer’s bounty, it seems like there’s never enough time to do it justice. 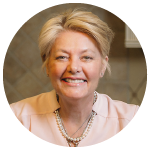 Hi Teresa, thanks so much! I’m so happy I prepared these having seen some variation or another over the year, spicing up the feta worked best for my guests, refreshing and they really showcase a table with a terrific pop of color. Yep. Agreed there never seems to be enough time in the season to get to everything! Watermelon and feta is such a great flavor combination. I have had it mixed in salad with blueberries with a lemon vinaigrette, but never as an appetizer. This is pretty and delicious…a flavorful party option. Hi Kelly, thanks much. Really, I can see how the watermelon and feta combination has become so popular, it really is so refreshing and delicious and combined together, not to mention, so pretty, it was almost like a centerpiece!